For now, just a graph. These are the criminal law voting patterns of the Judges who comprise the Court of Appeals. The Court that newly-appointed Chief Judge Jonathan Lippman has inherited. 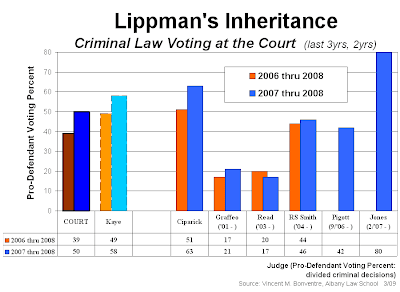 As a depiction of these patterns, the graph gives a good idea of the ideological leanings of the individual Judges--i.e., of Lippman's new colleagues (as well as of his predecessor, now-retired Chief Judge Judith Kaye.) And these patterns, collectively, give a good idea of the Court's ideological spectrum in criminal cases. Some of Lippman's new colleagues are obviously much more sympathetic to the claims of the accused (i.e., to due process concerns) than others. Some are much more attuned to the arguments of the prosecution (i.e., to efficient crime control).